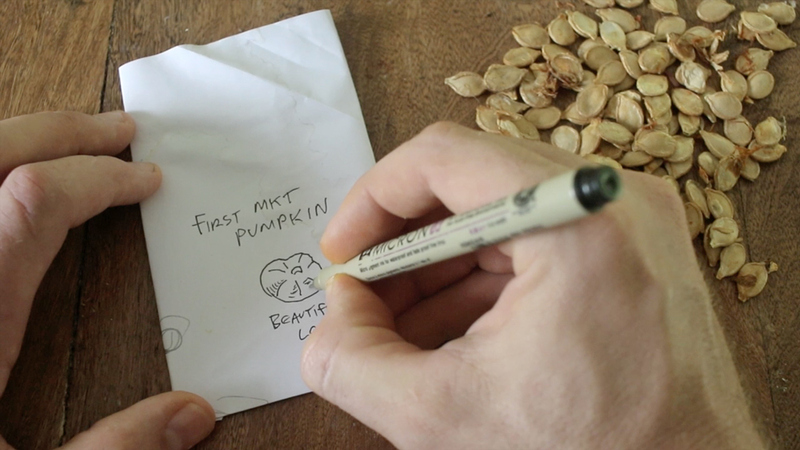 Just in time for Halloween, let’s cover how to save pumpkin seeds. Learning how to save pumpkin seeds is a good idea, especially if you’d like to grow next year’s jack-o-lanterns yourself. I’ve been growing pumpkin and winter squash for a long time and I’ve always loved how easy it is to save pumpkin seeds. 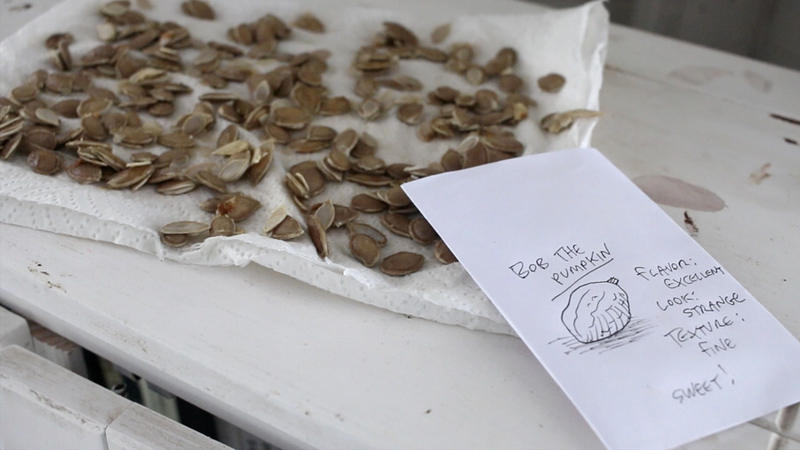 Recently I posted a new video on how I save pumpkin seeds – and how I make seed packets to hold them until it’s time to plant them in the spring. Now let’s break it down into a nice visual guide with pictures and everything! 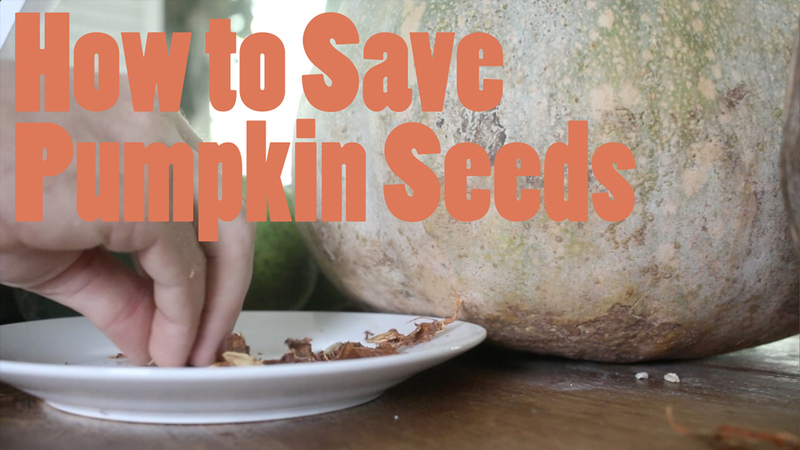 Are you ready to pack away seeds like a kleptomaniac squirrel so you never have to buy another pumpkin from the store again? I will help. Step 1: Gut the Pumpkin and Save the Slop! The inner cavity of pumpkins and winter squashes is filled with a stringy mess of pumpkin bits and seeds. This isn’t the “good eating” part of the pumpkin, so it’s not worth trying to save any of the stringy mass, except for the seeds. In order to do that, move on to step two! 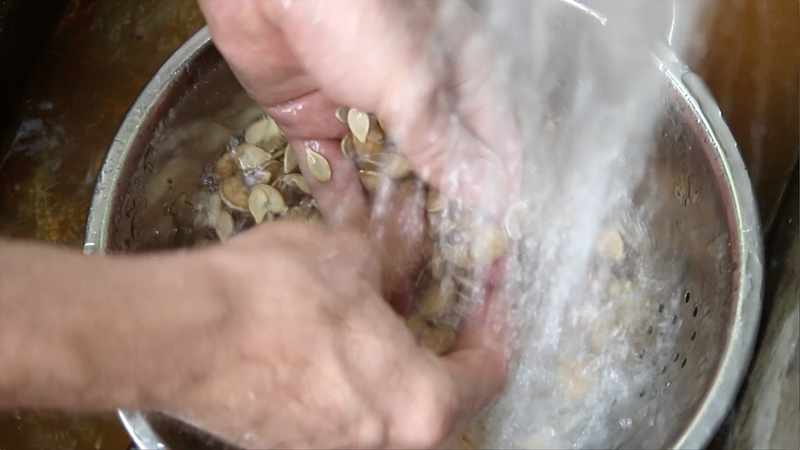 I dump pumpkin guts and seeds into a colander and swish them around under running water to clean them out, smashing the goop through the holes and separating the strings. 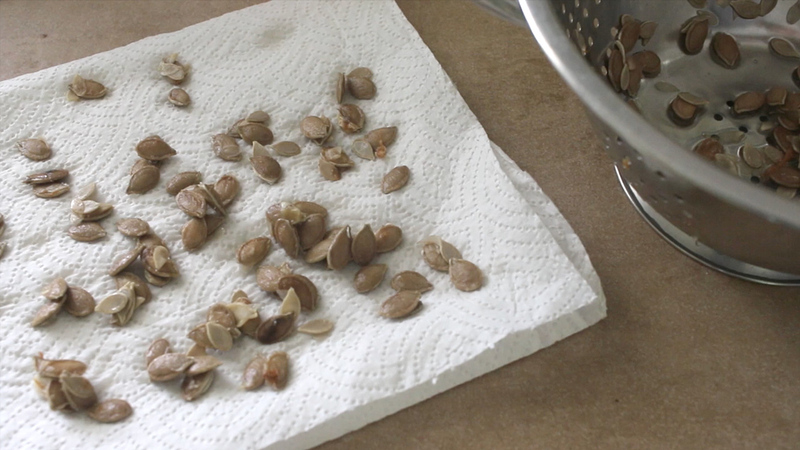 If you’d like to save pumpkin seeds for eating rather than planting, you can just go directly to roasting them at this point. For seed-saving purposes, I’ve sometimes let pumpkin guts sit on the counter for a few days and rot around the seeds. This smells bad but really loosens up the seeds when you wash them out. I think it may also increase the germination rate but I haven’t tried a side-by-side trial. Seed-covered paper towels on counters, windowsills, shelves, tabletops, dressers and even the bathroom counter are common in our house during the fall as we save pumpkin seeds alongside the other heirlooms we want to plant in our spring gardens. Spread your pumpkin seeds out someplace where they won’t get wet again. Make sure they aren’t too wet when you spread them out (sometimes I pat them down with one paper towel, then spread them onto a second) and have good air circulation as you most definitely do not want them germinating on your counter. They should dry fast. This will also keep them from molding as easily in storage and potentially losing their ability to germinate. Step 4: Make Seed Packets and Pack ’em Up! There are better ways to make seed packets, but I just rip a sheet of paper in half, fold that, then fold up the edges a few times and tape them. 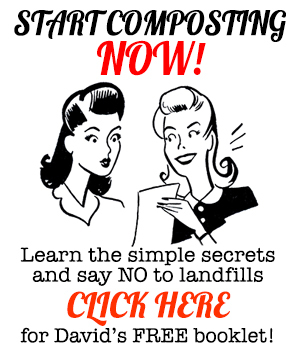 You can see how in the video – it’s very simple. Because I’m cheap and hate throwing things away too fast, I use scrap paper from the children’s homeschool assignments or pieces the toddler has doodled upon. My friend Steven Edholm has better looking seed packets, but they’re a bit small for the amount of pumpkin seeds I store. I also illustrate my homemade seed packets, which is NOT OPTIONAL. You have to draw on them. You just have to. It’s the rule. Along with a drawing of the mother pumpkin, I also note the variety, the harvest year and notes on type. This is important as I work on my pumpkin breeding projects, but for your pumpkin seed saving you likely just need to note the type or draw a nice picture of the headless horseman. If you live in a humid climate or need to store seeds for a longer period, you can dry pumpkin seeds a little further in a dehydrator (I like this reliable and inexpensive one for everything from fruit to jerky) and then pack them in tightly shut Mason jars stowed in the fridge. 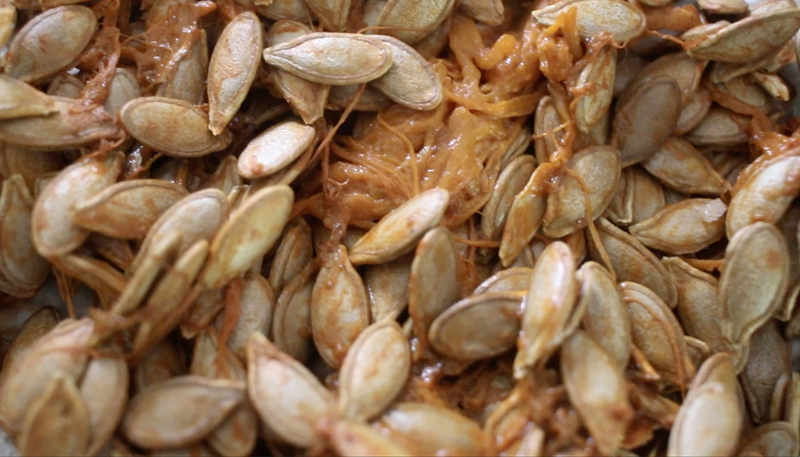 That’s it – the whole scoop on how to save pumpkin seeds. 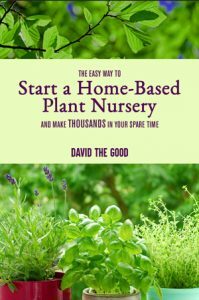 If you’re interested in going much deeper into saving seeds of all kinds, Seed to Seed is my own go-to resource on the subject. 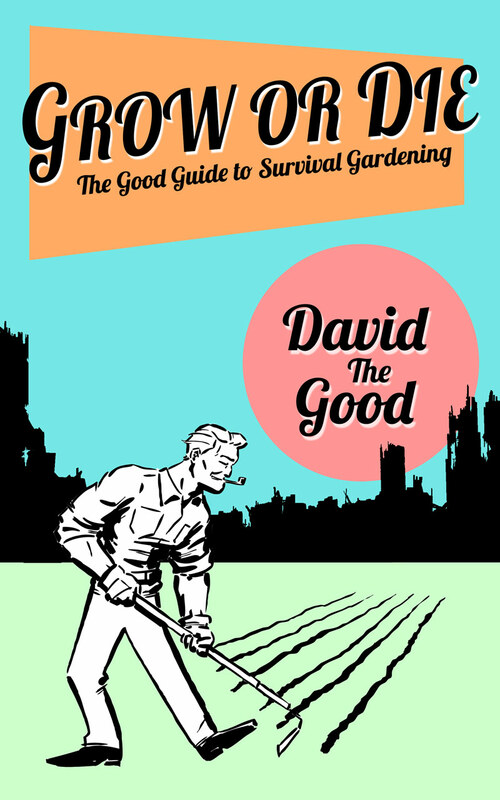 It’s a must-have for serious gardeners. Happy gardening and enjoy the rest of October. so, how do you store your packets of seeds? do you keep them in a glass jar? do then need to be chilled? I save them on a shelf in the house, unless I need to keep a variety for more than a year. In that case I pack them into a tightly-sealed jar and put them in the fridge. Send me some pictures of the plant, the fruit and the vines if possible and I’ll try to figure it out. Could be a few different problems. Just want to say thank you for all your great, entertaining, informative and sometimes relaxing information forums. I learn something new every time I watch or read. Appreciate that you give all the glory to God. I think I have purchased all of your books, bound and ebook, except the one specific to Florida growing. I’m gonna get that one too, so I have a complete “Good” library! Sometimes you are scary (like fiery explosions, snakes and Bahfeemus, to name a few!). Just to let you know, you ARE being watched (in more ways than you tube, heh heh). I found you at Herrick’s Deliberate Agrarian comments section a few years ago. Besides your books, I also got the Meadow Creature broadfork after watching you and Rachel use it. Well, long story short, if you want to slow down on cranking out Good books and hawking great tools, I might be able to take time to balance my checkbook 😀 Thank you! Thank you, Cheryl – that is very encouraging. I appreciate it. I’ve got a book coming out this year, hopefully by December at some point, plus two more planned for next year. I’ll try to keep them all affordable. And not too scary. I’m fairly new to gardening and am still learning a lot, but I’m curious how you make sure your different pumpkins aren’t getting cross pollinated? If they are growing in the same area, isn’t there a danger that the same bee will pollinate two different plants, resulting in a cross-bred seed that won’t breed true to the type you wanted? Audrey, that is a good question. You can’t easily keep them from crossing. There are multiple species of pumpkins, fortunately, and multiple cultivars inside each species. For instance, Seminole pumpkins and butternut squash are both the same species: C. moschata. That means they’ll happily marry and have little hybrid babies with attributes of both parents. However, you can grow C. moschata types right next to C. maxima types and they won’t cross. So if you had Seminole pumpkins and Hubbard squash in the same garden, you could save seed from both without worry. It helps to know the species and then plan your gardens accordingly. Personally, I enjoy crossing a bunch of varieties of squash and pumpkin and seeing what happens in future generations. If you start with nice cultivars that taste good, there’s nothing to lose, really, as you may end up with a brand-new variety all your own. Thank you for this! I’ve been reading a great book on seed saving by Suzanne Ashworth called “Seed to Seed” and it is helping me a lot. Your answer sounds a lot like most of what she teaches in her book, that it’s important to know the species and plan from there. Thanks again! I started this process last Halloween, but stopped before drying the seeds, threw them in a Ziploc bag still damp from the rinsing, and put them in the refrigerator to finish “later”. Later quickly became never, until I realized this spring I still had a bag of damp pumpkin seeds in the back of my refrigerator. Figuring I had nothing to lose, I planted a few, they all sprouted and are actually growing more vigorously than my purchased seed packets. I saved my pumpkin seeds from last year and planted them this year with good results. And yes, you definitely have to cartoon your seed envelopes!